Eighteen scholars and experts from around the world will convene next month on August 4-5, the opening weekend of the US Go Congress, at the AGA’s 2012 International Go Symposium, principal organizer Peter Shotwell announced recently. Nolan Bushnell, who started the computer-gaming movement when he founded Atari in 1972, will deliver the keynote address on Saturday evening, August 4. 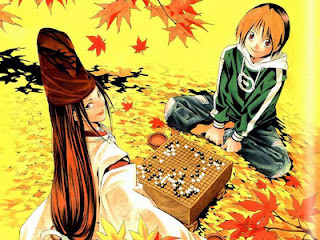 Hotta Yumi, the creator of Hikaru No Go (see graphic), will also give a talk and answer questions. Other featured speakers will include filmmaker Marc Moskowitz and Chinese pro Stephanie Yin 1P, who will discuss go in China today, with some clips from Moskowitz’s film Weiqi Wonders. Chen Zuyuan, a leading expert on rules, will describe the evolution of “territory” and “area” scoring. On Sunday, a panel of experts will discuss the unique positive benefits of go on development, showing how and why every community can have a go program. Other presenters will address a wide range of topics, from multivariate analysis for computer programs to several essays on go history to how go can serve as a context for the emergence of minority leadership. The conference — which is sponsored by the International Go Federation – will conclude with the unveiling of the winners of The 2nd International Go Art Contest late Sunday afternoon, August 5. “Almost 100 people have registered for the Symposium, but for those who can’t make it to North Carolina, we plan to stream the conference live, and make the presentations available in a video archive,” Shotwell said. Click here for a list of presenters and descriptions of what they plan to say.